Alright, so you've mastered the scarf and you're pretty comfortable knitting hats. Shawls are a cinch and you've got a pair of mittens or two under your belt. It's time for your first big project: a knit sweater. There's no need to be nervous casting on, you have AllFreeKnitting to help you out! Whether you're looking for a simple top down sweater to get your needles warmed up or you want to dive right into a complicated lace pullover, we have a collection of patterns that's perfectly suited to your skills. From Knitting for Beginners: 17 Speedy Sweaters to the rugged selection of designs in Knitter Tested, Man Approved: How to Knit A Sweater for Men, you're sure to find more than a few styles that catch your eye. Looking for even more sweater patterns? Check out our popular free eBook, How to Knit a Sweater: 7 Free Sweater Patterns! Knitting for Beginners: 17 Speedy Sweaters - Want to learn how to knit a sweater but not sure where to start? This collection of easy sweaters is the perfect way to get your feet wet in the art of sweater knitting. Novice knitters as well as seasoned veterans will find each one of these patterns simple yet satisfying. Full and Fabulous: 14 Plus Size Sweaters & Knit Cardigan Pattern Ideas - Calling all plus size pretties! We've rounded up some of our most stylish sweater and cardigan patterns for full-figured ladies. Long lines and slimming silhouettes abound in this timeless collection of plus size knits. 22 Super Cozy Knit Sweater Patterns - Comfort is key in this collection of 22 Super Cozy Knit Sweater Patterns. From thick cable knit pullovers to thick and chunky cardigans, there's a comfy sweater that's sure to warm the cockles of your heart. 10 Lightweight Knit Sweater Patterns - However, if you're feeling a little too toasty, we have something on the lighter side for you. This stylish mix of lightweight knit sweaters and cardigans is perfect for breey spring days or cool summer nights. Find fashionable ways to layer year round in this delightful collection of lightweight sweater patterns. 20 Super Cute Knit Baby Sweater Patterns - Bundle up baby in adorable pastel hues, delicate lace designs, and cozy hooded wonders. 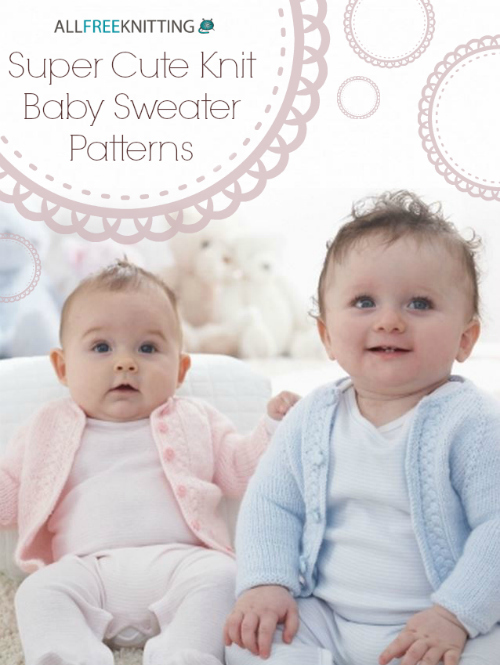 This utterly adorable collection of 20 Super Cute Knit Baby Sweater Patterns is the perfect resource for baby shower and first brithday gift ideas. How to Knit a Sweater: 9 Easy Patterns - Even more sweater patterns for your knitting pleasure. Delight in flatttering pullovers and easy stitchwork. Novice and veteran knitters alike will find this collection of nine patterns simple yet satisfying. Knit from the Top Down: 9 Sweater Knitting Patterns - Knitting from the top down offers the opportunity to try on your sweater as you knit. This allows for stitch modifications and a truly custom fit. Check out these top down sweater patterns for children and adults. 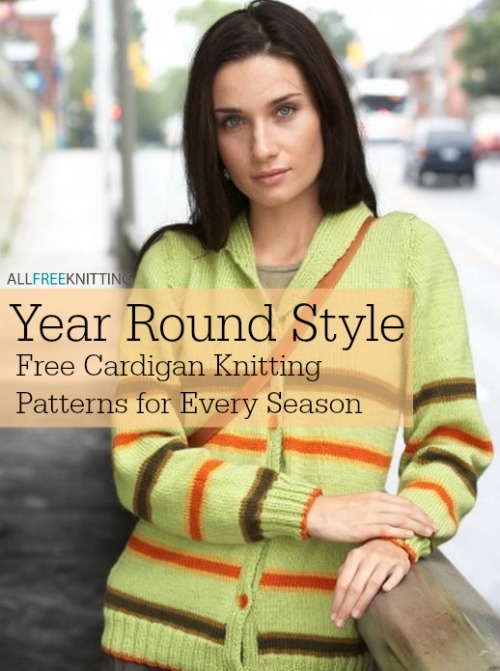 Year Round Style: 20 Free Cardigan Knitting Patterns for Every Season - The easiest way to add warmth without the weight, a knit cardigan pattern should be inside every knitter's wardrobe. Check out some of our favorite ways to layer in this stylish collection of 20 free cardigan knitting patterns for year round flare. 3 Knit Sweater Patterns for Fall Weather - In this micro-collection of patterns, we've highlighted the perfect knitted design for men, women, and babies this autumn season. Knit one for everyone in your family! 9 Comfy and Cozy Knitted Sweater Patterns for Fall - Autumn is the kick-off season for warm weather knitting, so get ready for the cold with this collection of ultra-comfy knit sweaters for fall. Knitter Tested, Man Approved: How to Knit A Sweater For Men - Calling all men! We've rounded up our most handsome cardigans and sweaters for your knitting pleasure. Simple designs and classic styles abound in this masculine colleciton of rugged knits.